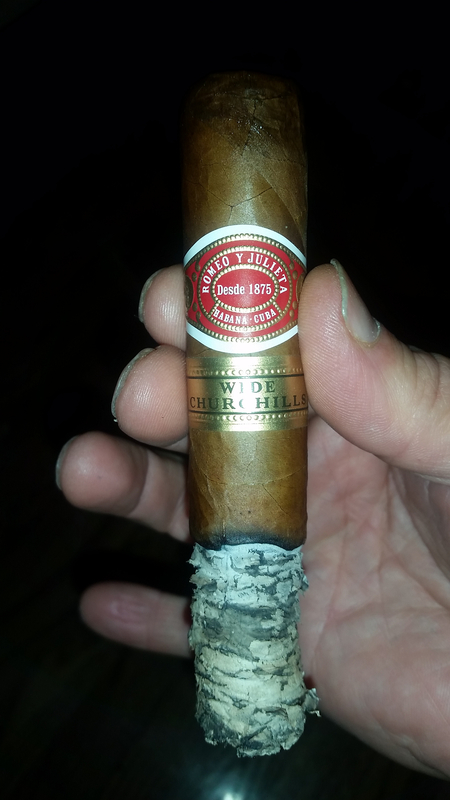 This tasty little H Upmann Cuban beauty deserves the spike. Getting near the end. Saves the fingers from getting burnt! Only cigar I ever smoked that far down was a Romeo y Julieta Cuban Corona. It was just too good to put out. I was wishing for a pair of my old roach clips that night. I only do it once a month or so - probably spend less on cigars than most anyone here. Even at $25 a pop. Yeah, I only smoke 1-2 sticks a month typically. One of my go to everyday type of smoke. Acid Deep Dish. 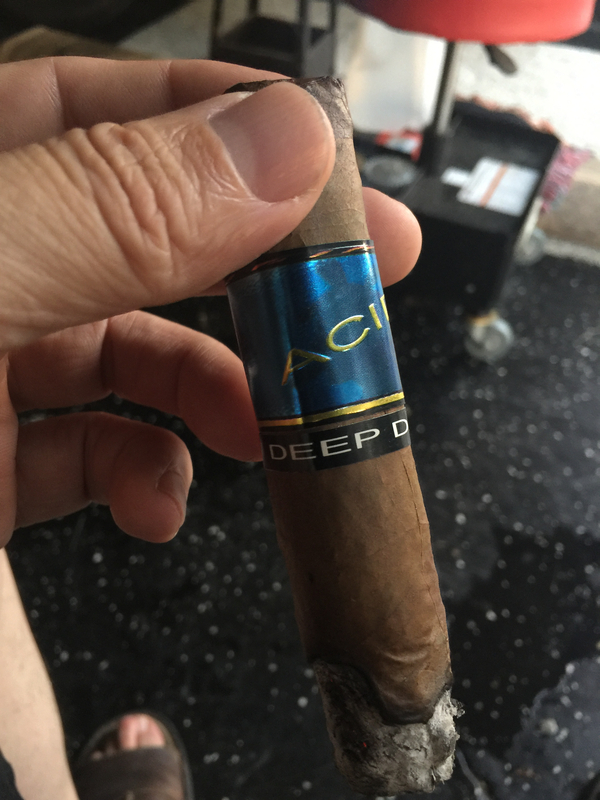 I've had a few Acid Deep Dish cigars in my humidor for 4 years or so. I wonder if they're still good. Even better. As long as the humidity was set. I’ve got a few that are that old too. Asylums Dragons Milk that are discontinued. Saving em for special occasions. I pick a box of these every time I visit Vegas. Local guy has a shop off the strip, so prices are low. Las Vegas Cigar Company. He imports em directly from Nicaragua This one is called the sweet. Yummy! Humidity been at 65% over the years, sometimes drops to 60% when I forget to put distilled water on the beads for a few weeks. Now, temperature swings I have no control over, and they've unfortunately seen 90+ degree days. Mmmm. Should be fine. I just pulled an Acid Blondie out that I forgot was there. Sometimes if too moist you can dry box em for a day or so to get em smokable. One of my cigar buds just got back from a 6 week trip and I’m looking forward to having one of my Padrons with him. Nothing like a good Habano to soothe the soul after three straight weeks of work going very badly. Nice Cuban, Kerry. Hope this week at work goes better for you. So what do you guys follow, cellophane on or off in the humidor? Forgot to report back here. 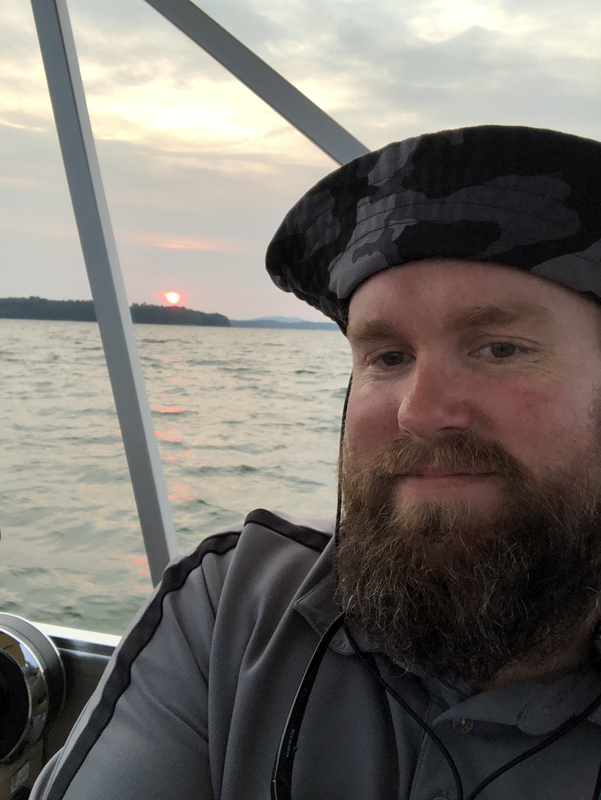 Had two beauties on the boat this past weekend. Best place to smoke a cigar. The best place to smoke a cigar is OFF the boat....underwater. I keep mine on. In the box too if there’s room. Right now it’s so jammed that I I had to un box my last purchase and place them in one of the trays. Time for a bigger humidor! I've always recommended cellophane off as the cigars will not continue to age properly inside the cello. Cuban cigars do not come in cellophane. Most other brands use to come without cello, but, became a necessity for vendors to have the ability to bar code individual cigars. Now, most, if not all, cigars come with a bar code sticker on the cello. As for storage, I store them in their original box inside a large cabinet humidor, and, try to leave the lids slightly open for proper air circulation. SLB's are my favorite boxes as they are perfect for air circulation. Even in a large cabinet humidor with pretty good humidity retention and air circulation I will still rotate the cigars inside their respective boxes from time to time. Dude we need a pic of the cigars! Just poking on you a bit! No worries! His communication, organization and work are all top notch. It depends on the cigar and your humidor. Cellophane WILL slow down the aging process, that's not always a bad thing. Some cigars are better when they are "fresh", too much aging strips them of their flavor. If you want a cigar to age quicker, then take the cello off. If you don't have a particularly well sealed and VERY stable humidor, cellophane staying on is an extra layer of protection for your cigars when you do have dips and spikes. There is no easy answer to this question. The best answer is still, it depends. Good points here. My remarks and experiences are based off of my time running the humidor at our local shop. I've always had large cabinet humidors, as well as cigar rooms, in my home. I've had desk top humidors, but, prefer to store my cigars in a large cabinet, or, walk in humidor with active humidification. 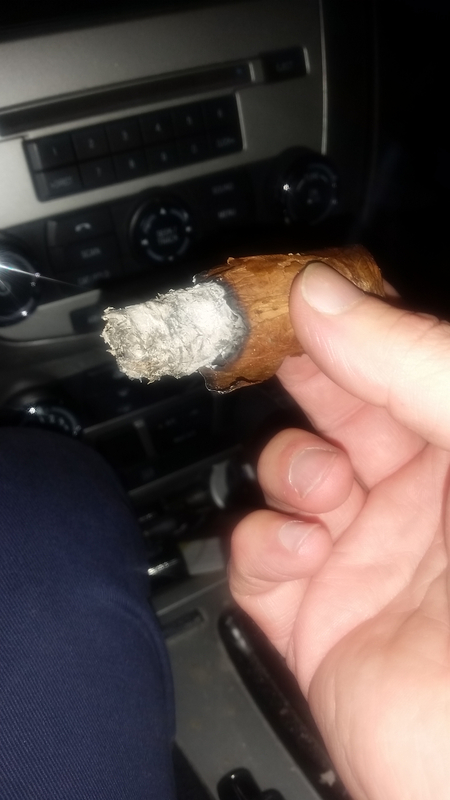 Hopefully, if you're buying boxes of cigars you are buying sticks that can handle some age, or, are going to be consumed before their oils have dissipated too much. I like laying my cigars down and observing the changes that take place...watching them develop and really open up. Today most cigars are ready to smoke the day you buy them, though, I've rarely seen a cigar that won't benefit from some more aging. Thirty years ago cigars were harsh and raw due to young tobacco being rushed to market. The industry boomed and makers that had experienced an extended period of declining acceptance and were caught off guard and unprepared for the cigar renaissance. I would say that we are in the greatest period of cigar tobacco production we've seen in our lifetime, maybe ever, though that could be hard to verify. Farming and production methods are at their best in many ways allowing for a large selection of premium leaf in amounts that allow makers to properly age them as well as experiment with blending. More cigars are good, immediately after purchase, than not, however, even with the of massive amount of great, well developed tobacco there are still many cigars that can withstand extended time in the humidor. Cubans are still the exception to the rule in ready to smoke cigars as most of their tobacco isn't aged like the non-Cuban tobacco. Their tobacco is still aged, but, not quite like what the non-Cuban producers have been doing. Over the past 10-15 years the Cubans have renewed their efforts to remain the premier tobacco producing country and they are providing several different production levels that showcase new types of tobacco leaf as well as extended aging. 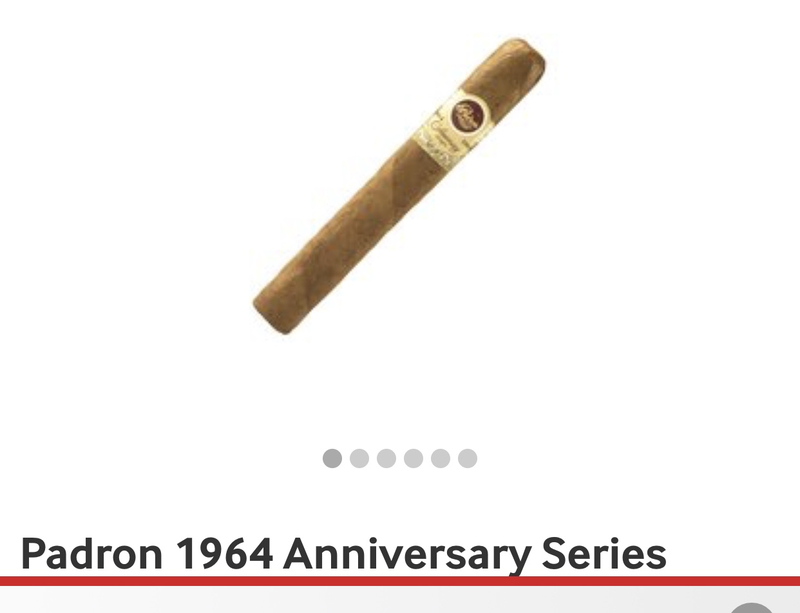 Most Cubans can be enjoyed immediately, however, practically all of them will show signs of youth unless it is an aged selection, which will command a much higher price. Here's a 6 year old La Aroma de Cuba robusto that I smoked while on break at work the other night. The wrapper split on me toward the very end, but, they're subject to that when they have some age on them. I'm coming to the end of a box of 25 of these, and, they've never smoked better than they are right now. 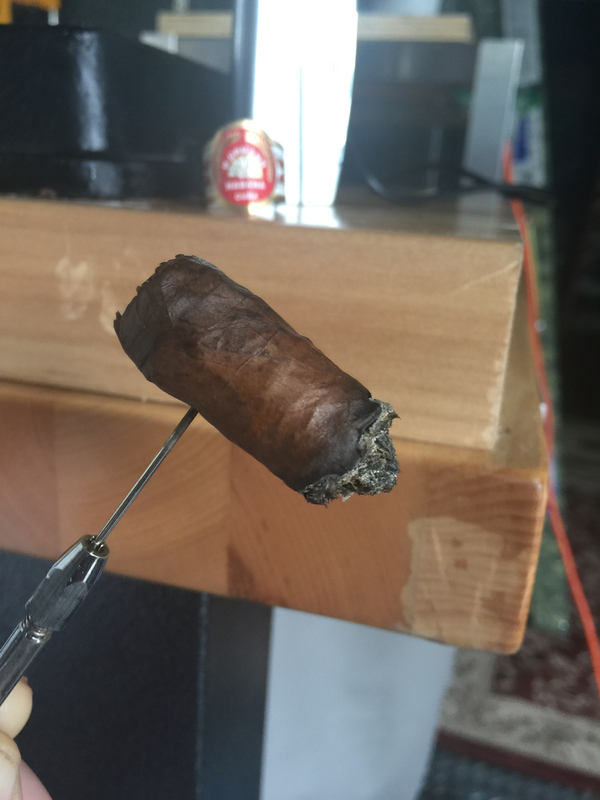 I very rarely smoke a cigar down to a nub, but, I really didn't want to put this one down. The sun is finally shinning here in SE PA. 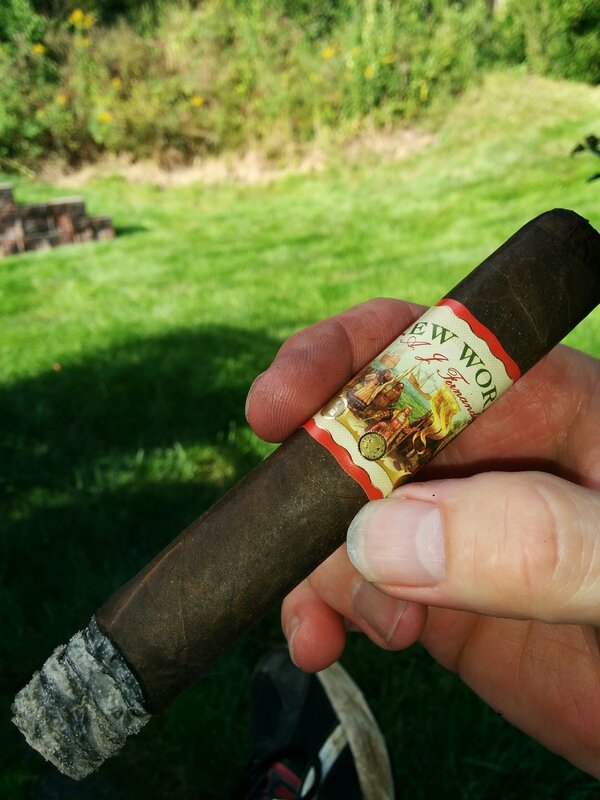 Relaxing outside with a nice cigar. 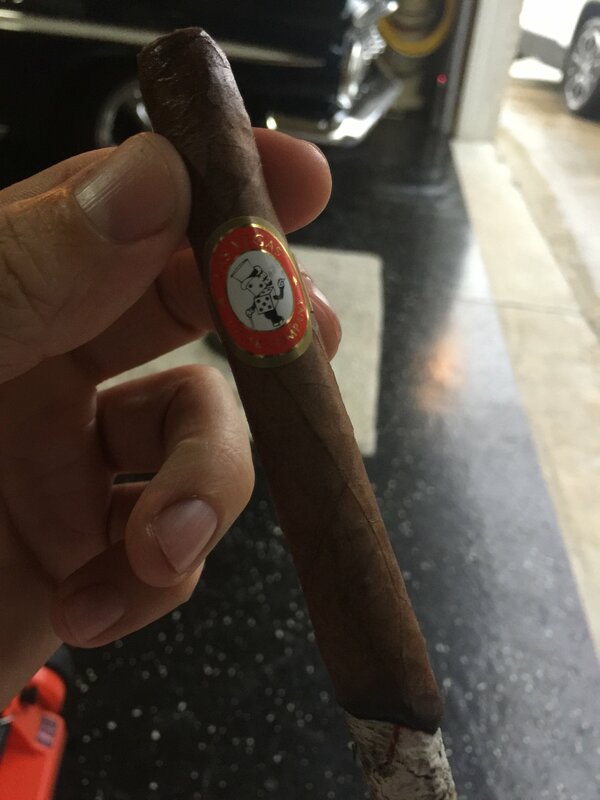 Can't go wrong with an AJ Fernandez crafted stick. I'm smoking a lot of A.J. Fernandez cigars these days. Every one I've had (probably 6 or 7 different) have been really good. Smoke on. Yep! Got a box of those in the humidor!